With a reasonable weather forecast for the day of brisk south westerly winds, we booked another charter on the MV Scimitar which operates out of Eyemouth harbour. Once kit was safely stowed, the coordinates of the wreck of the SS Shadwan were loaded into the GPS and the M/V Scimitar headed down the coast past Burnmouth and Berwick towards the distant island of Lindisfarne . The aim of the day was to locate and dive the wreck of the SS Shadwan, a Victorian era steamship which floundered in a gale with the loss of all hands on the 28th November 1888 . Built in 1877 by CS Swan and Co, the Shadwan was a 256 feet long steamship of 1538 tonnes. She was lost whilst on passage to Leith , Edinburgh with a cargo of cereals and flour. 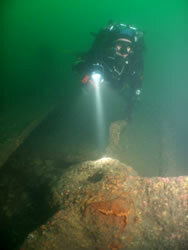 Her wreck site is situated between Lindisfarne and Berwick in an area not noted for heavy diving activity which perhaps explains why this vessel is not well known amongst the diving fraternity. She lies in 20 m of water depending upon the state of the tide. Today the Shadwan lays broken up and scattered across the seabed, so can be quite difficult to locate with a sounder. Nevertheless, the Scimitar’s skipper, Derek Anderson, managed to speedily locate the wreckage on our arrival at the site and the shot line was soon dropped over the side of the Scimitar onto the wreck site below. Descending down this line underwater visibility initially looked to be very promising. However nearer the bottom the visibility dropped but was still a respectable 3 to 4 metres. It is evident from the corroded state of the iron work that this is an early steam vessel. We quickly managed to locate a collapsing boiler which is partly buried into the seabed. We also came across old cargo winches as well as a large iron propeller which appears to be the spare prop. 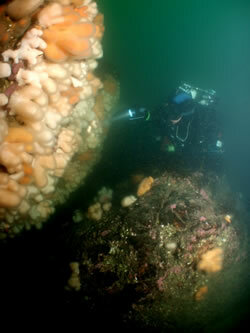 After 40 minutes into the dive it was evident that slack water was well past, as the strong spring tidal current was clearly beginning to run. With freezing fingers from the 5° sea water temperature we ascended back towards the surface and completed our safety stops. 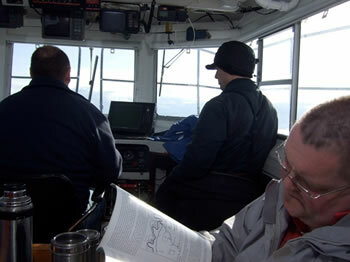 Once everyone was safely back on board the MV Scimitar headed back up the coast. Despite the south westerly breeze it was soon evident that the swell had picked up and was beginning to crash onto the Rocky shore line. The original plan had been to complete a second dive on the site of the wreck of the SS President, but with the increasing swell we opted instead to search for a scenic site that the Hunts had dived last week, Leaguers Buss, a series of underwater pinnacles situated between Eyemouth and Coldingham that rise up from the seabed in 14 metres of water to within 4 metres of the surface. Again, using the sounder this site was quickly located and the shot dropped onto the top of the most easterly pinnacle. Descending down the line it was soon evident that the underwater visibility had deteriorated as a result of the swell passing overhead. 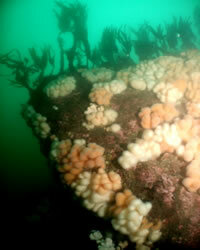 Nevertheless the steep walls of these large pinnacles were covered in a mass of soft corals. 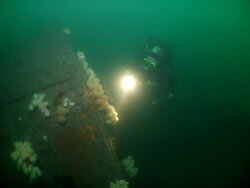 It was still very evident, despite the deteriorating conditions, that this site has the potential of being an amazing scenic dive in more settled conditions especially with better visibility. It also appeared to be a site that was very sheltered from the flooding spring tide. 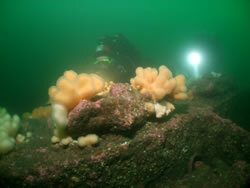 All in all, a successful day diving with two interesting sites located and dived. 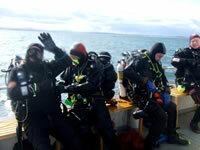 Thanks to Hubert for organising a great days diving.